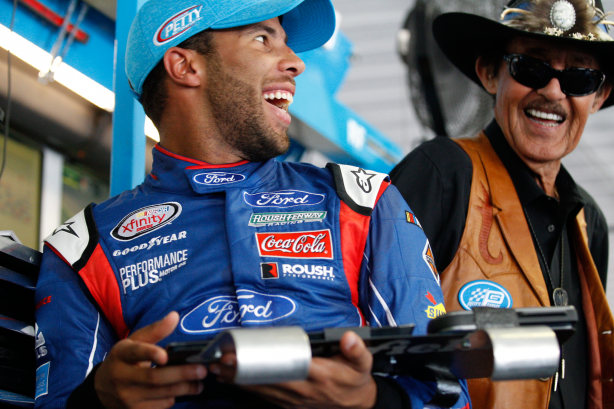 MOORESVILLE, N.C. (October 25, 2017) – In one of the organization’s most anticipated moments in its history, Richard Petty Motorsports announced today Darrell “Bubba” Wallace Jr. as the new driver of the No. 43 made famous by team co-owner, “The King” Richard Petty. Wallace, 24, will compete full-time in the Monster Energy NASCAR Cup Series and for the Sunoco Rookie of The Year beginning at the 2018 Daytona 500. Wallace, a native of Mobile, Alabama, is already one of the sport’s most popular figures with an incredible record of success behind the wheel. A graduate of both NASCAR’s Drive for Diversity and NASCAR Next programs, Wallace has broken several barriers and records throughout his rise within the sport. Earlier this season, Wallace made his Monster Energy NASCAR Cup Series debut as a substitute driver for the injured Aric Almirola in the No. 43 for Richard Petty Motorsports (RPM) at Pocono (Penn.) Raceway on June 11. Wallace showed rapid improvement over the four races he participated, substantially improving his finish position every race, culminating with an 11th place finish at Kentucky Speedway on July 8. Wallace initially rose to prominence in 2013 with a NASCAR Camping World Truck Series victory at Martinsville (Va.) Speedway, becoming the first African-American driver in 50 years to win a NASCAR national touring series feature since NASCAR Hall of Fame driver Wendell Scott. The next season Wallace finished third overall in the truck series point standings with four wins for Kyle Busch Motorsports. Wallace moved up full-time to the NASCAR Xfinity Series with Roush Fenway Racing in 2015, where he earned 31 Top-10 finishes over the last three seasons before making his Cup debut in June with RPM. Veteran and winning crew chief Drew Blickensderfer will continue to lead the No. 43 team in 2018 with Wallace. Petty believes that Wallace brings the current youth movement to RPM. Wallace will become the first full-time African-American driver in the Monster Energy NASCAR Cup Series since Scott. Partners for Wallace and the No. 43 team for the 2018 season will be announced at a later date. A performance and marketing driven company, Richard Petty Motorsports, co-owned by NASCAR Hall of Famer Richard Petty and successful business entrepreneur Andrew Murstein, is one of the most recognized brands in all of motorsports. With a history of over 200 wins and business partnerships with national and global leaders, today the race operation fields one team in competition in the NASCAR premier series.